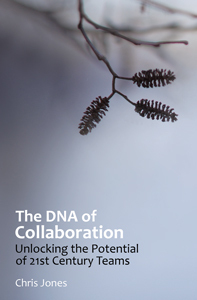 This entry was posted on Saturday, May 12th, 2012 at 2:30 pm	and tagged with #cdna, #CollabDNA, book, collaboration, DNA, language, metaphor, preview, story, teams and posted in amazon. You can follow any responses to this entry through the RSS 2.0 feed. I am so excited to read this book! Collaboration is a word used but not often put into action. People are social beings, meant for interaction. When we isolate ourselves, our perceptions can become distorted. Social, according to Dictionary.com, is “living or disposed to live in companionship with others or in a community, rather than in isolation.” I appreciate your perspective in this book that people are more productive when connected. It makes me think of an unplugged lamp, lacking energy, dark and uninteresting… now, plug in that lamp and you have spark, light, and vision. Same concept applies to a social environment; we are energized through various venues that encourage collaboration, but we must be plugged in. I also believe that connecting across departmental lines reduces the tendency to work in silos. A more organic form of communication flows through various outlets which increases knowledge sharing. I’m excited to see those lamps light up–because, after all, who wants to work in the dark? Love your energy and insight Shannon, thanks so much for stopping by to comment. Also appreciate your very gratifying review on Amazon. I think collaboration thrives most when it taps positive energy like yours ..